Juicy Booty playing at Fly Casino is a new progressive Jackpot slot with 5 reels and 25-paylines. This new slot is a massive hit that offers a lot of special features and great bonuses for you to enjoy. It will take you several spins to get used to the reels, but thereafter you’ll love the game! 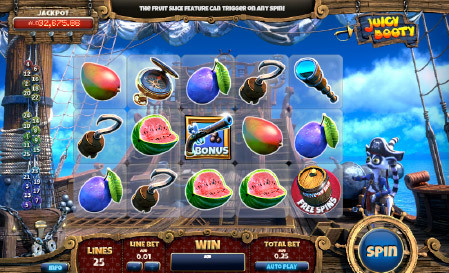 You can win anywhere from 5 to 50 Free Spins when three or more of the Scatter Symbols appearing anywhere on the reels. Plus, there is an awesome Fruit Slice Feature that can randomly trigger during normal play giving you BIG winning combinations. VALUE MONDAY! From 00:00GMT until 23:59 GMT, all members are invited to receive a 65% bonus up to 195.00 on your deposits of $/£/€10 or more. $60 Gets 75.00! From 00:00GMT until 23:59 GMT, all members are invited to receive a £/€/$75.00 bonus on your first deposit of £/€/$60 or more made.